Shares of Zynga and Groupon rose Wednesday after Jana Partners disclosed a new stake. Groupon and Zynga -- two of the biggest social media flops -- have found a buyer in hedge fund Jana Partners. Jana Partners now owns roughly 3.3% of Groupon's shares and 3.1% of Zynga's, according to a regulatory filing. Separately, another hedge fund -- Tiger Management -- sold off its entire stake in Apple (AAPL) during the first quarter. And David Tepper's Appaloosa Management cut its Apple stake by 40%. 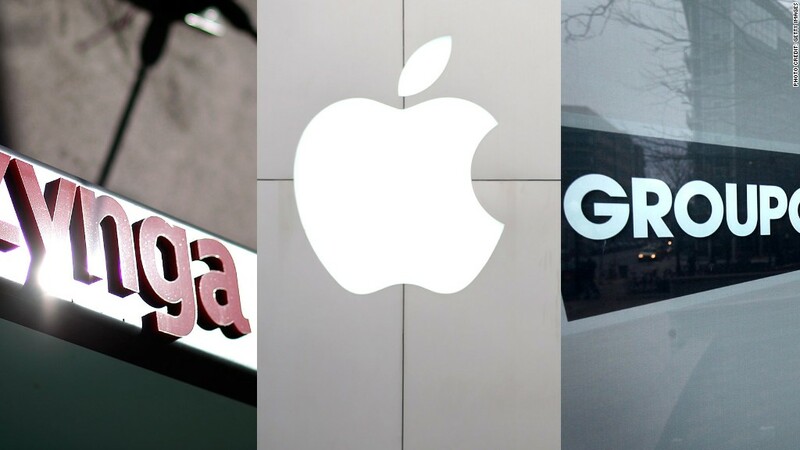 Investors quickly responded to the hedge funds' moves, sending shares of Zynga (ZNGA) and Groupon (GRPN) up more than 5%, while Apple's stock sank nearly 2%. It's unlikely that the management teams at Groupon and Zynga have found a clear ally in Jana Partners. The activist hedge fund run by Barry Rosenstein has become known for successfully agitating for major changes when it takes a stake. Jana successfully pushed for a breakup of publishing company McGraw-Hill in 2011. Both Groupon and Zynga have seen their stock prices fall nearly 65% since they went public, so management teams of each company will have trouble simply dismissing activist shareholders. Groupon's leadership may be more receptive to change. In late February, the daily deals website fired its eccentric founder, Andrew Mason. Zynga founder and CEO Mark Pincus, known for obsessively controlling all aspects of the online gaming company, is likely to more resistant. Jana hasn't said whether it will seek changes at either company. Wednesday's disclosure by both funds came via the 13F filings that hedge funds are forced to give to the SEC 45 days after the close of the quarter. Hedge funds are only required to disclose so-called long bets, or stocks they own. Investors often look for what stocks major hedge funds are betting against but the SEC doesn't require funds to disclose those bets. Meanwhile, for Apple, signs that more investors are jumping ship only adds to pressures on the tech giant's stock. Shares are down 38% since hitting an all-time high above $700 last September. More filings from other major hedge fund managers are due out after the bell. Investors will be looking more closely at what another Tiger hedge fund did with its Apple stake. Tiger Global, run by Chase Coleman, has been bullish on tech stocks. As of December 31, the fund owned more than 1 million shares of Apple. Tiger Management, run by vaunted money manager Julian Robertson, owned just 42,125 shares, at the end of 2012. Hedge fund managers can often move markets with their comments and disclosures. Tepper, the top-earning hedge fund manager in 2012, was said to have sparked Tuesday's stock rally, after he made bullish comments about the markets on CNBC. His first-quarter stock purchases seem to coincide with a bet on a continuing economic recovery. He bought new stakes in construction companies Fluor (FLR) and KBR (KBR). He also disclosed new stakes in insurance firms Lincoln National (LNC) and Prudential Financial (PRU). Appaloosa also revealed a new stake in Hess (HES). The oil company has been the target of activist hedge fund Elliott Management, which has been pushing the company to get rid of its current board of directors.